Nintendo is cutting off your supply of the Wii version of Super Mario All-Stars, the limited edition collection of four NES era Super Mario Bros. games with a 16-bit makeover. But it's also giving you one last chance to buy it. Nintendo of America said today it's producing its "final run" of the Super Mario All-Stars Limited Edition package (released stateside in December), with the last shipment expected to hit stores on March 13. If you haven't been able to secure a copy, which includes a soundtrack CD and handsome 32-page Super Mario History booklet, this may be your only opportunity. 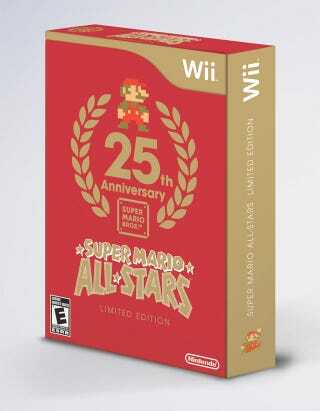 On the other hand, you could show your support for better 25th anniversary collections from Nintendo by not buying it. Your call, Wii owner!